My last post was about ornament – on a small scale – in the garden. Time to think bigger now, especially for those of you like my blogging friend Deborah, who commented about needing a focal point at the end of her under-construction pleached Lime Walk. 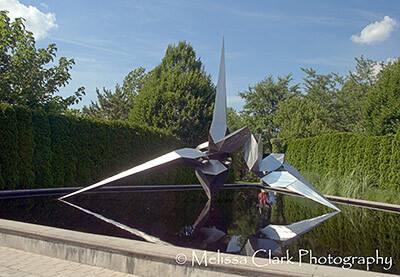 Several summers ago, I visited Grounds for Sculpture, a 35-acre sculpture garden and museum in Hamilton, New Jersey. 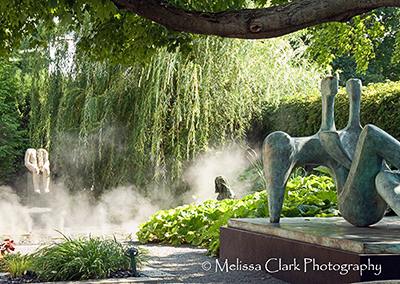 More than 300 sculptures dot the grounds, most of them cutting-edge contemporary, some in a ‘water garden’ filled with mist and fountains. Many of them (see above) were too large for the average residential garden, at least the ones I know. The trip reminded me, however, that carefully chosen and sited sculpture can add a tremendous amount of interest and visual excitement to a garden. 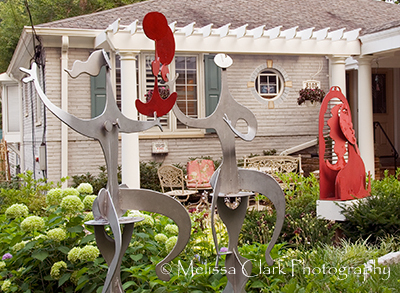 Here are some points to keep in mind in incorporating sculpture in a garden. Choose a piece because you like it, and think carefully about where you want it placed. Do you want to be able to view it from many places in the garden, and/or from a particular window in your house? Or do you want it tucked away for a visitor to discover at the end of garden path, a little surprise that makes the journey worthwhile? Formal marble statues look right at home in more traditional gardens, surrounded by lush plantings or clipped evergreens. Large abstract structures may need more open space around them, and backgrounds of trees or shrubs that are closer to their own scale. 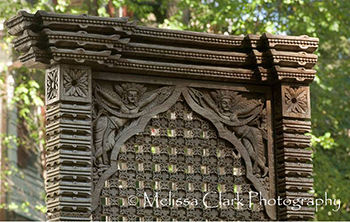 Wooden Nepalese screens that formerly hung in a client's family room now serve as sculptural elements in the garden. Sculptural elements can be re-purposed from other settings. 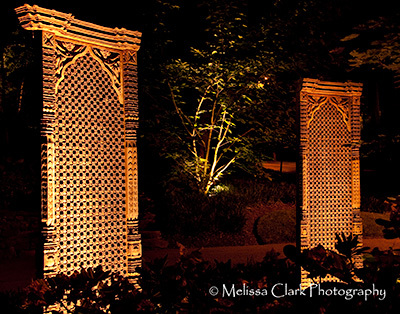 Some of my landscape design clients in Chevy Chase, MD recently mounted three carved Nepalese wooden screens, shown above, in their front yard as sculptural elements surrounding a new copper beech tree that has replaced a hickory tree downed by a lightning strike. To provide additional interest and highlight the screens’ addition to what is otherwise a traditional woodland-style garden, the owners have lit their sculptures for night viewing, giving the garden extended interest even after dark. In a somewhat different situation, several years ago I designed the front garden of an architect who is also a sculptor. His front yard already contained a pair of free-standing figures. I suggested moving another, smaller red sculpture from the back yard to be placed in front of a new small patio next to the front of the house. Eventually, he plans to build a third sculpture for the junction of the original house and an addition to its right which he built several years ago. (I wanted a tree there but when we couldn’t identify one that would stay as small as he wanted, I said, “There’s the perfect reason to make another sculpture!”). To the greatest extent possible, I kept the plantings around the sculptures low and neutral, avoiding shrubs or perennials that I thought would compete with the playful metal figures that are the first thing that strike your eye when you pull up to the house. In my “home town” of the metropolitan Washington DC area, the Hirshorn Museum has its own sculpture garden, described by the Washington Post as a “welcoming urban park” after its redesign and reopening in 1981. The National Gallery also has a Sculpture Garden directly across from the Gallery’s West Building entrance (don’t miss the playful “typewriter eraser” sculpture by Claes Oldenberg and Coosje van Bruggen near Constitution Avenue). Farther afield, interested visitors can visit Grounds for Sculpture in New Jersey or the Storm King Art Center in Mountainville, New York . 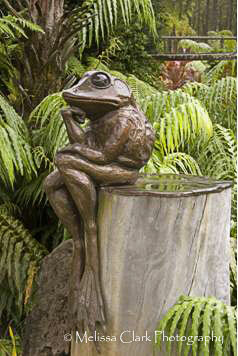 This frog sculpture, entitled 'Heavy Thoughts,' greets visitors at Na Aina Kai Botanical Gardens on the island of Kauai. Headed to Hawaii? On the island of Kauai, work in a visit to Na Aina Kai Botanical Gardens on the North Shore, full of tropical plantings and a wide variety of sculptures throughout the garden’s 240 acres. Check each center’s website for hours and directions. You may find some inspiration for your own garden!